We love passion fruit! Called calala or maracuya in Nicaragua, delicious passion fruit is awesome mixed with plain yogurt, granola, and a drizzle of honey. 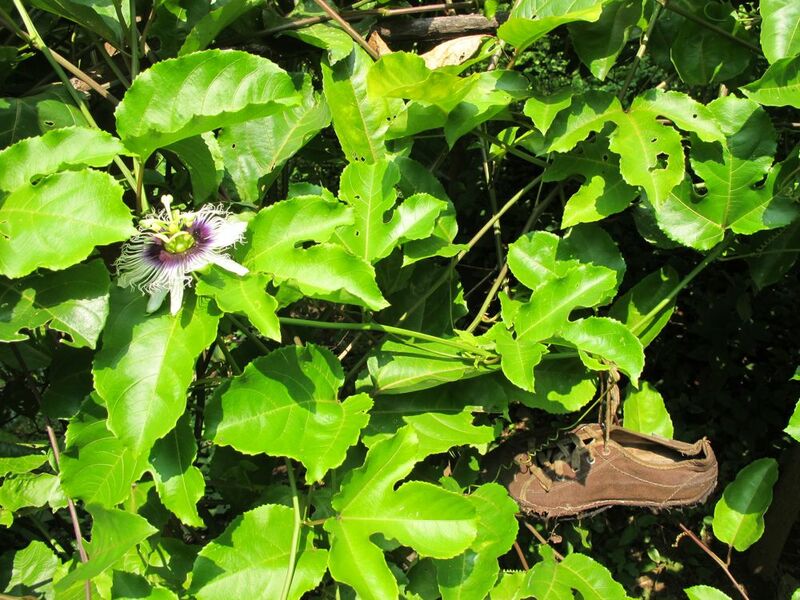 We buy them a dozen at a time and have been eagerly awaiting for the flowering of our passion fruit vine. We planted it last August and have watched it grow to become an enormous entity. It’s crawling up the roof, into nearby trees, and trying to latch onto anything it can wrap around to reach new heights. Sadly, with all this crazy growth it had yet to produce a single flower. I asked a few local guys if there was anything I could do. Fertilizer? More sun? Less sun? Some different watering strategy? What’s the deal? The answer I got was that I needed a shoe. 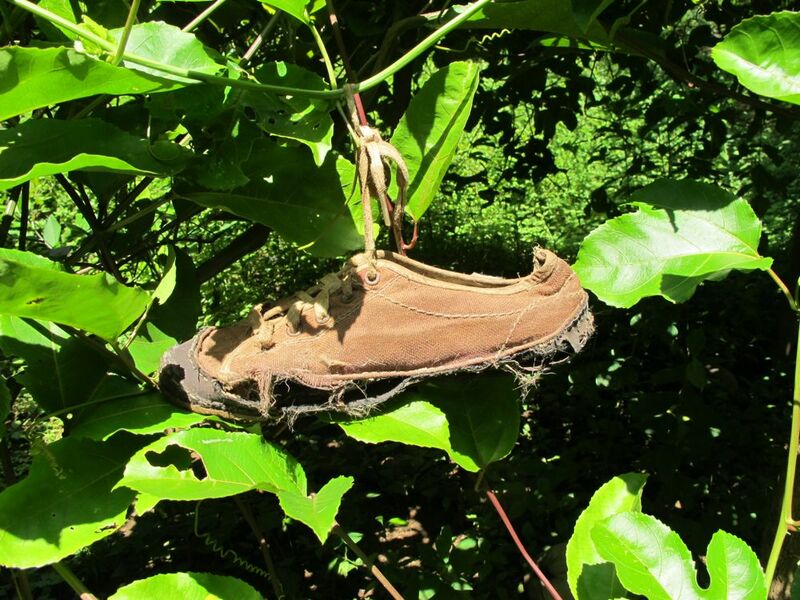 If I tied an old shoe to one of the vines it would start producing flowers, they said. A shoe? Really? Ok….. I started watching for shoes in the piles of driftwood on the beach. I found a few broken sandals, but that just didn’t seem right. Eventually, I picked an old Simple shoe, one half of a pair that had been my favorite for years. They are lightweight and eco-friendly, made with hemp, recycled rubber, and water-based glue. For that reason they fell apart after a few years of use. How eco is it if you have to buy a new pair so often? – the topic for another discussion. Anyways, I grabbed the more beat up of the pair and tied it onto a vine. I was hopeful, but honestly doubtful. Imagine my surprise when a little over a week later I was out pruning the vine, trying to keep it from swallowing the little lime tree planted next to it, when I saw what I thought was the beginning of a flower! A few hours later when the sun hit the plant, the flower opened. No denying it, my recycled shoe had created a flower! Amazing! Not that I ever really did, but I will never doubt simple local knowledge again! Ha! This entry was posted in Gardening and tagged hipehabitat, holly beck, how to make a passion fruit vine flower, nicaraguan folk knowlege, passion fruit flower, passion fruit vine. Bookmark the permalink. that flower looks just like the ones i saw on a vine down in the canyon below the Westfiled tennis court. i thought it was so unusual, i brought it home to show mama, and she wanted to grow the plant here. We brought home a ripe fruit, took the seeds out, dried them, planted them, but they didn’t grow. so we later brought home a couple of fruits that had fallen to the ground, and dried those out. i think she planted a whole fruit. the others were still on the table by the jacuzzi when you were here recently. you asked me what they were. Were they california passion fruits? i wish i had looked at them closer. i can’t really remember. i think they were pretty small. our passion fruits are a little bigger than a baseball, but the california variety may be smaller. i do know that there are many different types. some are edible and some are only decorative. you’ll have to try one when you’re down here! My problem are just too many flowers a not a single fruit, what can I do? my vines are about a year old and very healthy. Did you try the shoe trick yet? I just tried this a week ago on my two year old vine that wouldn’t fruit and to my amazement it just started putting out flowers today. Stunned and thankful that this works. Thanks a million for sharing!!! Happy in Orlando. Perhaps this is related to the wisdom that beating a fruit tree wakes it up and it produces fruit (beating with a 2×4 wrapped in a blanket, softly! ).